Don't mean to beat a dead horse (or, deer, as the case may be). But I've had this drawing - as indicated - for over a year now. Created by my deer slaying son, his prophetic vision indeed came to pass this past November. In case you need a reminder, click here for the rest of the story. 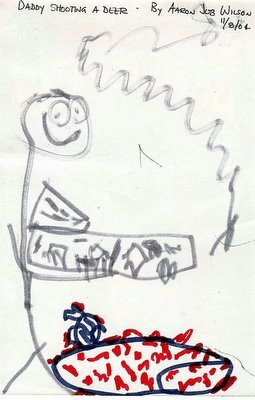 I'm not sure if my son's drawing depicts me actually shooting the deer (note the smoking barrel on the serious firearm I'm toting), or if he thinks I stabbed the poor mammal to death!